There is nothing crueler than exhausting and exploiting animals for entertainment purposes and money. 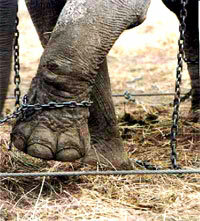 The most popular way of using animals for entertainment is the circus, of course. Circus-animals do not have the normal life of an animal: they spend half of their day in their modest cage, walking up and down the bars, while the other half of day they spent on nothing else but being constricted to learn some difficult and probably strange tricks they have to present to the audience later on. For animals it is not easy to have that kind of life. First of all, the only way to learn most of the tricks is through violence, such as intimidation through whacks or hits with whips. Most people think it is easy for animals to learn the "feats", but it is not. If you think about it, it is not natural for animals to jump around like human do, to ride a bicycle, to dance to the music... Someone has to teach them in a very violent way how to do it. Did you know that except of whacking them with the whip, trainers hit them with electro-shocks too? But that is not enough! If an animal is not able to learn something, they will not give him/her food for who-knows-how-long. That is a hard job for an (innocent) animal, don't you think so, too? There is one more thing. 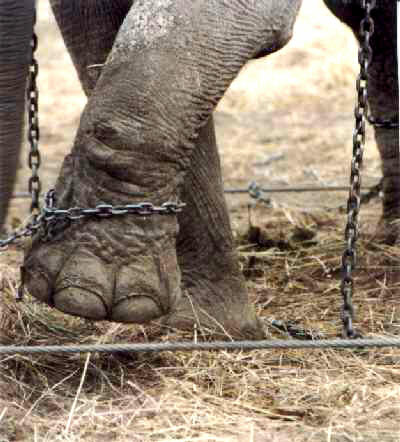 Maybe you ask yourself how come that the circus' animals never attack their trainers? The answer is next: they are drugged. That's right, their trainers benumb them to calm down before a show (or lessons), so the wild animals won't have a desire to attack. Except of circus-animals, there are lots of circus-people too. Unlike animals, these people are very talented and they get paid for their feats and the hard work they perform. Too bad circus-animals are not that lucky. But even if they would get paid for all that hard work, I don't think circus animals would be happy with living in cages and performing for an applauding audience, so loud, that it again scares the animals. The only place where they can be happy is the place where they belong to: in the wild, the nature. Only there they can be truly happy and lead a normal life. Today there already are circuses that don't use animals at all anymore. Only people do the show there. I think that all circuses should be like that. If you want to stop the animal torture in circuses, there is at least one thing you can do, avoid that kind of circuses and try to convince your friends to do the same, explaining them why. If there is less audience in "animal circuses", there is going to be less money coming in for the circus and... less poor and unpaid hard working animals as a result one day!